Sample preparation for the analysis of drugs in biological fluids (Yoshihiro Saito et al.). Chromatographic methods for the analysis of drugs in biological fluids (Hassan Y. Aboul-Enein et al). Capillary electrophoresis for the determination of drugs in biological fluids (Zakariya K. Shihabi). Immunoassays for the therapeutic drug monitoring and clinical toxicology (W. Clarke). Validation of bioanalytical methods (S. Berthier). Dose and therapy individualisation in cancer chemotherapy (G. Hempel). Rationale and utility of therapeutic drug monitoring for the optimisation of antibiotic therapy (C. Ong, D.P. Nicolau). Therapeutic drug monitoring of antipsychotic and antidepressant drugs (P.B. Mitchell). Monitoring immunosuppressant drugs (D.W Holt, A. Johnston). Pharmacogenomics: methodologies for genotyping and phenotyping (P. Jannetto et al.). 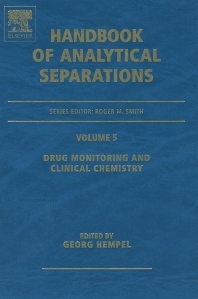 Drug Monitoring and Clinical Chemistry, the 5th volume in the Handbook of Analytical Separations series, gives an overview about methods to analyse drugs in biological fluids. The most widely used methods to analyse drugs in biological fluids. i.e. chromatographic methods, CE and immunoassays are described in detail. For important drugs, an overview about the methods available and a comparison of the techniques should be given to enable the reader to choose the right method depending on laboratory equipment, staff, the aim of the investigation etc. Other general aspects important for conducting therapeutic drug monitoring or pharmacokinetics studies are also covered, i.e. sample preparation, validation of the analytical methods and pharmacokinetic methods for interpreting the data. Areas where therapeutic drug monitoring is used frequently such as antibiotics, immunosuppressant drugs, antipsychotic and anticancer drugs will be discussed in detail. In addition, the important field of phenotyping and genotyping for therapy optimisation with special focus on real-life applications is also covered. The book contains important information for analyst working on drug analysis in clinical chemistry, hospital pharmacists involved in therapeutic drug monitoring, other pharmacists, chemists or physicians working on pharmacokinetic studies in industry or academia. In contrast to other books in this field, this book provides up-to-date information regarding both methodology and clinical applications. For the applications, only fields are described where therapeutic drug monitoring is used in clinical routine and provides benefit to the patients. Georg Hempel is a pharmacist who did his Ph.D. with Gottfried Blaschke in Münster on chiral separations using HPLC and capillary electrophoresis. He worked as a laboratory supervisor in the paediatric oncology department of the University Hospital of Münster. During his postdoc with Eli Lily and Company Ltd. in the United Kingdom, he became involved in pharmacokinetics. Since 1999, he has been working at the Department of Pharmaceutical and Medical Chemistry at the University of Münster, where he established a Clinical Pharmacy research group. His research interests include bioanalytical methods for the quantification of drugs in biological fluids, especially capillary electrophoresis, pharmacometrics for therapy optimisation in special patient groups and medication management.